Hi, hope you’ve all had a lovely weekend. So for today’s post I’ll be talking about my top ten beauty products and the best thing is there all under ten pounds, because who doesn’t like a top ten and a bargain right. This pallete is the best budget buy highlighter I have used, with its rose gold packaging and four colors, one cream and 3 powders with a mixture of both matte and shimmer effect, it definitely looks more expensive than its £9.99 price tag. This pallete adds a luminous finish and a radiant glow to skin. It’s easy to wear as it suits most skin tones, its blendable and buildable to create a finish that’s right for you. You can also wear each shade as an eyeshadow or I use the purple shade to mattify my lipstick and it creates a Unicorn effect. Sleek lipsticks are fast becoming my favourite budget lipstick as its high pigmented colour stands out and is available in a range of colours. The semi-matte formula doesn’t dry out your lips, like some matte lipsticks can do. It also stays put and doesn’t smudge and lasts all day. Being a busy mum this lipstick is ideal as I don’t have the time to be topping up my lipstick all day and worrying that im walking round looking like the Joker. This face form kit makes contouring easy on the go with three shades in a small handy mirrored pallete. The kit contains three shades a sculpting powder to contour, a gold shimmer shade to highlight and a bronzer shade to add warmth. The shades are high pigmented and easy to blend. The colors are a natural shade, so you don’t look like You’ve been tangoed. I use this pallete daily. This Budget Eyeshadow pallete featuring sixteen shades with a mixture of matte and shimmer finishes. For the price the eyeshadow’s are well pigmented,and durable. this eyeshadow pallete is a great dupe for the two-faced semi-sweet chocolate pallete. * When I purchased this foundation it was on offer and under £10. This Concealer is the best one i have used and have just recently purchased my second one. This concealer is easy to apply as it comes with a built-in sponge applicator and is easy to blend. It provides great coverage as it brightens the under eye area making this concealer good for highlighting. I’ve also found that this concealer doesnt dry and look cakey as i have found that to be the case with my Rimmel wake me up concealer. To see how i use these products check out my GRWM-Makeup Routine . I was impressed with how easily this oil removed my waterproof makeup. I didnt have to scrub to remove my makeup which meant my skin wasnt as irritated. When washed off and used with another cleanser for double cleansing, It leaves skin looking radiant as it hydrates skin and leaves behind no sticky or oily residue. This moisturiser is perfect for his time of year as it is lightweight with a gel like consistency, which leaves skin looking radiant, and plumper. After using this night cream my skin feels smooth and not as dry. It doesn’t leave my skin oily like the thicker moisturisers can do at this time of year. This spray on moisturiser is easy to apply and time-saving as it drys quicker than other moisturisers and isn’t sticky or oily meaning you can get dressed quicker. It also has a lovely fragrance. This moisturiser leaves my skin feeling smooth and soft and has helped with my dry skin. This dry Shampoo has a sweet-smelling fragrance that will leave you wanting to sniff your hair. It leaves hair feeling refreshed without a chalky feel. I end to use this as a volume spray as its great at adding volume to my roots. If your stuck on what dry shampoo would be best for your hair type and to meet your needs the team at Reviews.com have done the leg work for you to determine the best dry shampoo on the market that delivers fresh hair without a full wash. Click here for the review. The best dry shampoos all in one place so you don’t need to spend your precious time trawling the internet looking for reviews. Tip – don’t spray too close as you will end up with white hair. * Prices are correct at the time of posting and as always all views and opinions are completely my own. 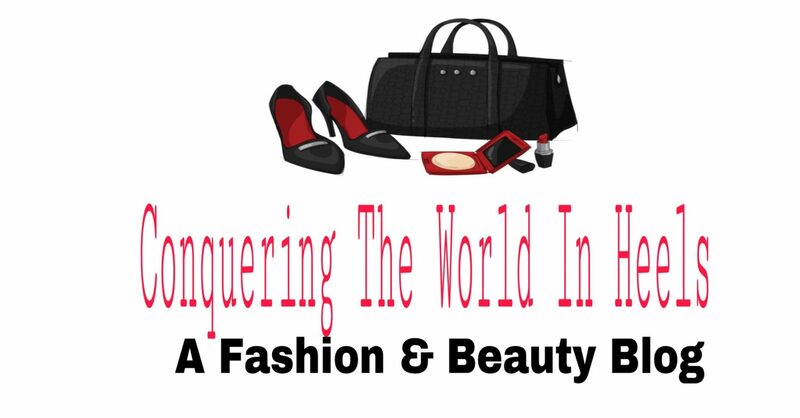 Check out and follow my facebook page for interactive chats about all things fashion and beauty related and follow my instagram for a glimpse into my daily life. Hi, Hope you’ve all had a lovely weekend. This weekend I was lucky enough to be invited to an evening wedding reception at Wortley Hall. The grounds and the building was breathtakingly stunning, so not one to miss out on a photo opportunity, I took some pictures of my outfit to share with you. This outfit centres around this eye-catching lilac/grey floral print culotte jumpsuit with Bardot detailing. I’ve been impressed with Primark lately they’ve really upped their style game. When I first laid eyes on this jumpsuit I loved it but nearly didn’t buy it as jumpsuits and culottes don’t normally suit me as I’m petite. However I’m glad I took the risk as I feel this really suits me, judge for yourself. I then paired this with items in the colour of the season millennial pink. 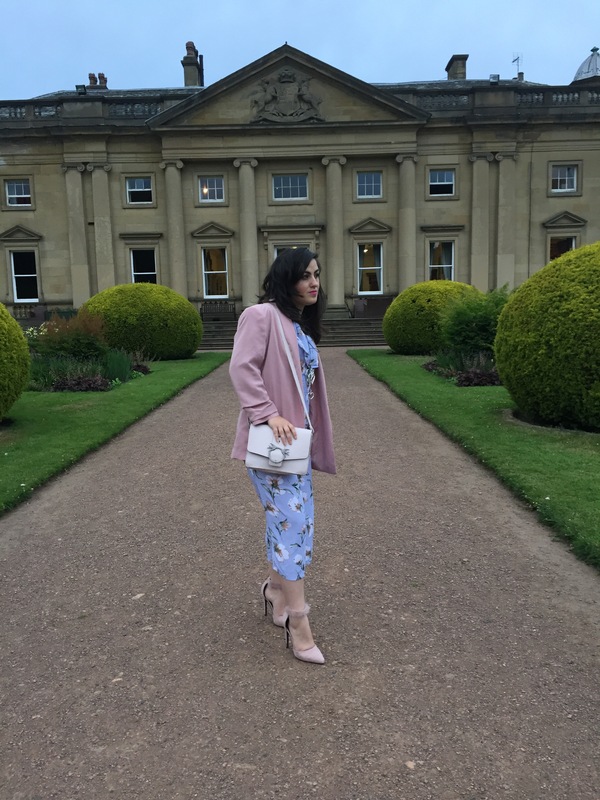 The oversised blazer with ruched detailing on the arm also from primark, a pink shoulder bag with circle Buckle details also from primark and pink fluffy court shoes. For the accessories I wore minimal silver jewellery and for makeup I wore a purple and pink smokey eye and a bright pink lip (also known as my Nicki Minaj lipstick). Yes I did reference the 90s song by ace of base in my title. Hi, hope you all had a lovely June. First of all I’d like to apologise for the lack of posting new material. These last few months have seen lots of changes in every aspect of my life. At the end of May, me and my former partner of 6 years and father of our 11 month old daughter decided to call it quits. So I’m back like living with my parents with a baby. First night back at home I remember feeling upset and down about the thought of moving back home and been a single parent. I suppose it’s the stigma attached to the single parent status and being 25 theirs that added pressure that you should have a career, be settled down and moving out and here I was doing it all opposite. But then came on the news about the terrorist attack in Manchester, where 22 innocent people lost their lives many of them young children. I spent most of the night crying for those people and their families. Being a new mum one of my biggest fears is anything happening to my child or anything happening to me what prevents me from taking care of my child. As I kissed my child goodnight that night I realised I was blessed and we all are blessed for every moment we get to share and spend with our loved ones. It completely put things Into perspective for me no matter what happens in your life as long as the people who matter to you are alive and healthy, does anything else really matter that much? The “IT” colour of the season is Millennial Pink. A few year ago if people would have said that I would even buy pink items yet alone love wearing them, and feature them in a favourites, I would have said shuuuutttupp (in my best Essex accent). This blazer instantly brightens up any outfit and makes it look put together with the blazers tailoring and detailing on the sleeves. You can wear this jacket with jeans, dresses, wear it at the office, and on a night out. It’s also lightweight for this seasons weather. Shock horror! Another item in the “IT” season of the colour. This bag definitely looks more expensive than its £7 price tag, with the bird detailing on the buckle. It’s also a great size for carrying my handbag essentials. This top has become my go to when in doubt on what to wear. It looks great on, fits like a glove, comfortable to wear, and is made from good quality material. I’ve been wearing this top with everything from jeans, shorts and skirts. I’ve also dressed it down in the day with a pair of flared hem jeans, and dressed it up at night with a pair of suede black lace up shorts. I’ve been wearing this red lipstick for the last month. A bright red lipstick instantly brightens up any look and can take you from day to-night. I love this colour on me as before I bought this lipstick I would never have worn a red lipstick but I feel this colour suits me. It’s a long-lasting bright matte lip colour that’s not too drying. I will definitely be purchasing more sleek lipsticks in a variety of different colours. This mascara is a firm favourite of mine I try others but always try this one again and fall back in love. The formula of the mascara is dark and covers all my lashes it makes them look longer without clumps and doesn’t dry and flake throughout the day. The tiny brush also coats all the lashes and separates them. This mascara also doesn’t irritate my eyes like some other mascaras can do. This serum makes my skin feel so moisturised and dehydrated. I definitely feels that it plumps up my skin, calms any redness and stops it from looking dull and dry. I use this serum in an evening after cleansing and before I use my moisturiser. I love all things supernatural so after reading and watching vampire diaries, twilight and Harry Potter I needed something else, that’s when I discovered the Morganville book series. The morganville book series revolve around a group of friends trying to stay alive in a town where no ones what their seem especially after dark. I’d definitely give this a read if you liked the vampire diary’s. This tea is the perfect drink to have before bed as it’s caffeine free, contains lavender and chamomile both known for their calming effects on the body. I dunno how to describe the taste of this tea but when I drink it, I just feel calm and de-stressed and all cozy and ready for bed. *all thoughts and opinions on products used in this post are completely my own.